It’s official. I’m a mom. I have been a mom for over a year, and these days, my parental identity is solid and clear. I remember when we first brought Josh home and started introducing him to people, I felt sort of awkward and uncertain. I realized in those moments that other people, even those who knew me well, didn’t know me as a mom, which meant I was introducing them to my 4-year-old son and Parental Karin at the same time. The trouble with that was that I didn’t really know what my identity as a parent looked like yet. For a while, my parental identity seemed to be getting stronger when I was interacting with Josh and establishing our family with my husband, but it seemed confusing and foreign when I was engaging in other aspects of my identity or when I was in “mom-centric” environments where the parental identity of others was in full force and I felt like mine was catching up. Naturally and gradually, I have grown into my parental identity, and now I have very few days where I experience those out of body “Whose life am I living? How did I get here? This must be a joke” moments. And that feels good. It feels like growth. But as established as I may feel as a parent, I appreciate it when I have new experiences that expand my parental identity, like today. Well, around 2 am this morning to be more precise. Caution: This next part is not for the weak-stomached. It was a rough night, to say the least. But I have to say, it was a good night, too. Some situations just make me feel more like a mom, and as someone who still feels like I am catching up in the parenting department, clear “mom moments” are encouraging and motivating for me. The image of the throw up all over his bed I could do without, but the image of my son looking at me with upset eyes and a quivering lip, seeking comfort from me, that is lasting and sacred. After Josh’s hard night, we all woke up feeling dazed and depleted, but unified. We had made it through, together. We had a lot of things planned for the day (t-ball, a brunch, a drive to Orlando for a special bridal shower), but the reality was that all of our plans changed as soon as Josh got sick. Dave and I looked at each other with understanding and contacted the people involved in our plans to let them know we wouldn’t make it. I don’t like to disappoint anyone. Sometimes, that results in my pushing myself too hard or compromising my highest priorities for extra commitments, but not today. 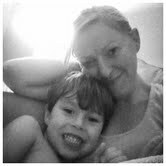 Today, I trusted my instinct and snuggled with my son in my pajamas. And it was a really sweet day. Life gets busy and full before I even notice it has happened. Sometimes, it takes a force of nature, like a hurricane or projectile vomit, to slow me down and simplify things. As I reflect on the last 24 hours and I think about my son sleeping soundly in his bed (with clean sheets), I feel full. And I realize that I feel a little more like a mom tonight than I did last night. This entry was posted in Adoption, Family, Motherhood, Personal Growth and tagged Parenting on October 13, 2013 by karinfields. Exactly one year and two days ago, we met our son for the first time. He was 4 years old. We planned to meet him at a neutral location, so his guardian chose a McDonald’s with a play place so he would have something to do. (Smart thinking. I love a good play place.) It was the most surreal experience of my life. We had just driven over 5 hours, leaving my stomach feeling queasy from anticipation, nerves, and car sickness. When we walked in, I searched my surroundings until I saw a little brown-headed boy with his back to me, playing in the play place. There he is. Does he have any idea what he is really doing here? Could he possibly understand the weightiness of this meeting or what it would mean for him? When he finally turned around, I could sense Dave’s breath catch in his throat. “He’s so small.” Dave whispered to me. Up until that point, this 4-year-old boy was theoretical- a dream. Now we are standing right in front of this little creature, and reality sinks in. In an instant, we both become paralyzingly aware of what we signed up for and are fighting the urge to pass out on the floor in amazement and fear. We walk toward this little wonder and tentatively say hello. He half-smiles, looks at the guardian, glances back at us, then resumes his play. At that moment, I realize the answer to my initial questions. This intuitive little boy knows exactly why he is here. All of my training in play therapy and child development flies out the window at that moment. All I care about is getting this boy to like me. I hold off on my desire to engage him immediately as he walks away, and instead I choose to watch him for a few minutes. I notice he keeps looking back at me as he plays. I track him with my eyes and respond with positive facial expressions. At one point, he jumps over the side of the slide, and I could sense as he looked at me that he wanted to assess how I would respond. I caught his eye and gave him a silly/scared face to let him know I saw what he did, and his safety is a priority to me. He smiled. After that, I stood up and initiated play with my son. I tracked his movements and his choices… “You’re picking that up. You’re looking at me. You’re smiling. You’re laughing; you think that’s funny.” Then I began reflecting his feelings… “You’re not sure about me. You seem curious about that. You feel happy when you do that.” Gradually, we began connecting. Dave thoughtfully approached and looked for his moment to engage his son. Josh asked me to lift him up to the highest part of the play area. I took this opportunity to incorporate Dave by making a comment about how much taller he is than I am. Josh looked at Dave, then back at me, then back at Dave with an affirming smile. Dave continued to lift him on to that platform for several minutes, and I sat there and watched my husband and my son play for the first time. We have had many firsts since that day. The first time Josh rode on Dave’s shoulders; the first time he called me Mommy; the first time he said “I love you”. We also have had other not-so-pleasant firsts. The first time Josh threw a shoe at me; the first time he fell off his bike; the first time he said “I hate you”. Although I do have times when I long for the missed moments, I don’t dwell on these thoughts. There are so many firsts and new experiences that I do get to have with my son. There are also firsts that I have gotten to witness with my nephew and nieces and close friends’ children. I was visiting one of my best friends the day that her oldest daughter walked for the first time. It was precious and sacred, and I will never forget it. I don’t begrudge others these beautiful moments, even though I didn’t get to experience them with my child, because I know that my son had these moments. These sacred moments happened, and whoever was there to witness them now has memories to hold on to and cherish. I take great comfort in that. And I take even more comfort in thinking about all of the firsts that I won’t miss. Josh’s first baseball game; his first trip to Disney World; his wedding day (God-willing). I don’t have any poopy diaper stories to share with other moms. That’s a bummer. But forever embedded in my memory and my heart is the day I first met my son; the first time he smiled at me; the first time he hugged me; the first time my husband picked him up; the first time I heard his little voice; the first moment I felt like a mother. And our first family photo, right there next to the McDonald’s play place. This entry was posted in Adoption, Motherhood and tagged Family, Firsts, Parenting, Play Therapy on September 10, 2013 by karinfields.